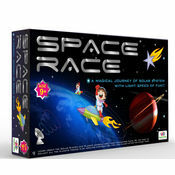 A Fun Filled Educational Quiz Game for Little Ones . always anxious to explore the world of animals, birds, & ocean creatures. kids should be well versed with these topics. 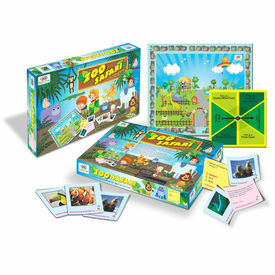 That exactly inspired us to come out with this fun filled board game ‘ Zoo Safari ‘ . 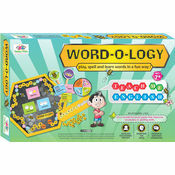 It introduces your kids to the fascinating facts of the animal kingdom in a ‘ play way ‘ method . Trivia cards have multiple choice answer format. The game is governed by the spinner card. So what are you waiting for !! GET , SET, GO !!! Zoo Safari A Fun Filled Educational Quiz Game for Little Ones . Hi Friends , Nature & Wildlife have always fascinated humans & kids in particular. Kids are always anxious to explore the world of animals, birds, & ocean creatures. From the point of view of general knowledge & school curicullum also it is imperative that the kids should be well versed with these topics. That exactly inspired us to come out with this fun filled board game ‘ Zoo Safari ‘ . It introduces your kids to the fascinating facts of the animal kingdom in a ‘ play way ‘ method . 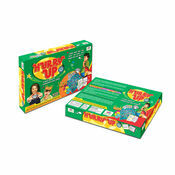 The game comprises of 216 quiz cards – ( 80 trivia cards + 50 guess who cards + 86 picture clue cards ). Trivia cards have multiple choice answer format. The game is governed by the spinner card. The winner of the game is crowned as the jungle king a is rewarded with a cute little toy crown . So what are you waiting for !! GET , SET, GO !!! 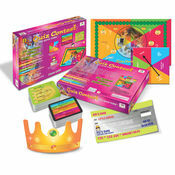 Contents : 216 Quiz Cards ( 80 trivia cards + 50 guess who cards + 86 Visual Quiz Cards ) Board Game, Spinner Card, Toy Jungle King Crown & Detailed Instruction Sheet In English & Hindi.